Ridesharing apps are changing cities around the world. Uber, for instance, has made getting a ride more affordable and convenient – but it has also faced accusations of unfair labour practices and disregard for local laws and passenger safety. Similar companies operate in the global South. In Indonesia, for instance, Go-Jek offers motorbike rides and errand services. It too has caused considerable controversy, says Sheri Gibbings, an assistant professor of Global Studies at Wilfrid Laurier University. 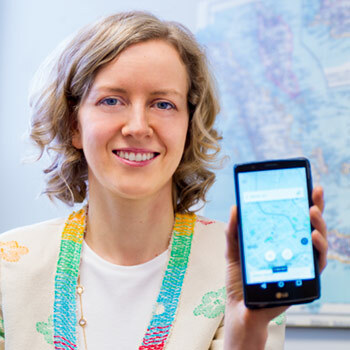 Gibbings and her research partner, Joshua Barker of the University of Toronto, recently received a grant of over $200,000 from the Social Sciences and Humanities Research Council of Canada (SSHRC) to study the effects of ridesharing services in Winnipeg and the larger city of Bandung, Indonesia. Ridesharing is commonly known as disruptive innovation, but just how disruptive it is hasn’t been extensively examined on a social and global level, says Gibbings, who is the principal investigator on the cultural anthropology project. Although Gibbings and Barker are just beginning their five-year project, there appear to be significant differences between the cities they are focusing on. In many Canadian cities, Uber has disrupted a formalized taxi industry where drivers are highly regulated and insured. In Bandung, however, it’s almost the opposite. For years, Indonesians have depended on informally organized drivers of motorbikes, called ojek (or ojeg). These drivers, who may not be insured or even licenced, cluster together at locally known stands and wait in order of arrival for passengers, with whom they haggle to establish fares. Now Go-Jek has established a system of vetting drivers, which includes checking their licences and the bike’s registration papers. Passengers also rate them after their ride. The drivers wear distinctive green jackets and offer their passengers a set price and clean helmets – ojek drivers may not offer a helmet at all. This formalization has caused conflict with some ojek drivers, whose reputations are built on neighbourhood word of mouth and who may not meet Go-Jek’s requirements, which include an age limit. Gibbings and Barker’s research project will establish circumstances in the two cities prior to the advent of ridesharing services, trace the development of these companies there, then examine the current impacts of ridesharing from the point of view of drivers, passengers and the corporations that run the services. The researchers, who will include undergraduate and graduate students, will conduct interviews as well as engage in participant observation in both cities – spending time with ojek drivers, Go-Jek drivers, taxi drivers, Uber drivers, and developers working on the apps. Planned project outputs include journal articles, presentations, a book, a workshop for scholars researching ridesharing and car culture, and roundtable discussions in Winnipeg and Bandung, which will bring together policy makers and various transportation stakeholders. Gibbings hopes her team's research will result in a deeper and more nuanced understanding of the “uberification” of transportation rather than prescriptions on how to manage the phenomenon.